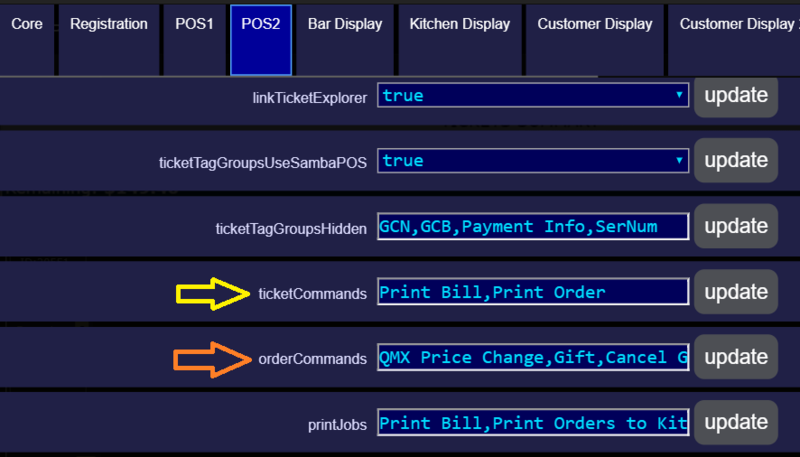 If you add Automation Command Names to the POS Config ticketCommands parameter, and if they are mapped to the Ticket screen, those buttons will appear in the Ticket Detail Screen (the screen that appears when you click the Ticket Header). In the same fashion, if you have Automation Commands mapped to Order Line, you can set the POS Config orderCommands parameter to show those commands, but in this case they will appear on the Order Tag Screen (ie. when you select an Order). You can also make Automation Commands prompt for Input or display Choices. See the next 2 following posts for information on how to set this up. In addition to adding your own Automation Commands to the Ticket and/or Order Screen, you can also do some "special" things with Commands that are configured in a certain way. 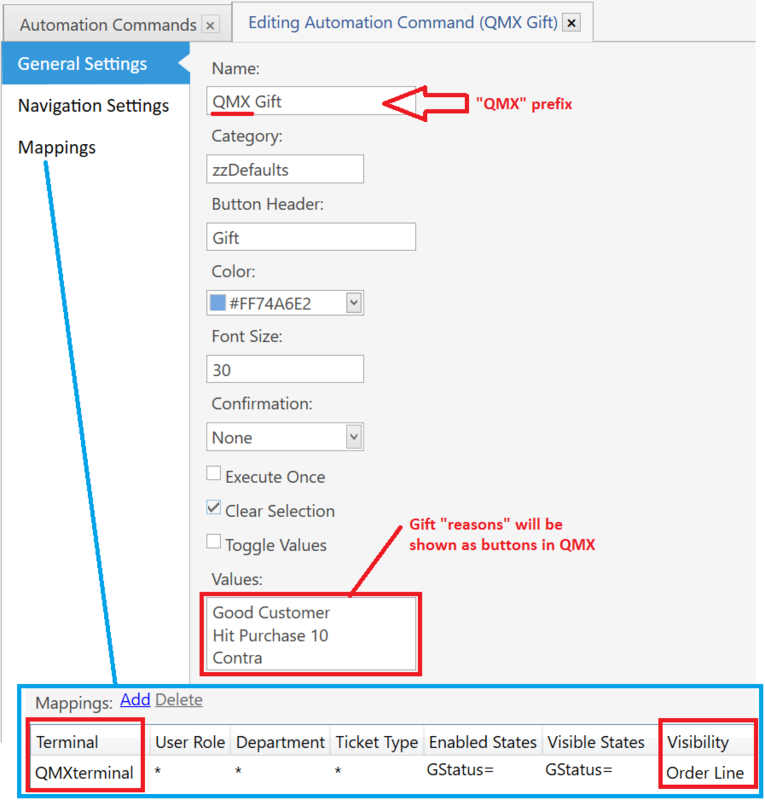 The configuration starts with creating an Automation Command that has a special "QMX" prefix. This prefix means that this command will be treated in a special way - that is, it will prompt for a value when it is triggered. 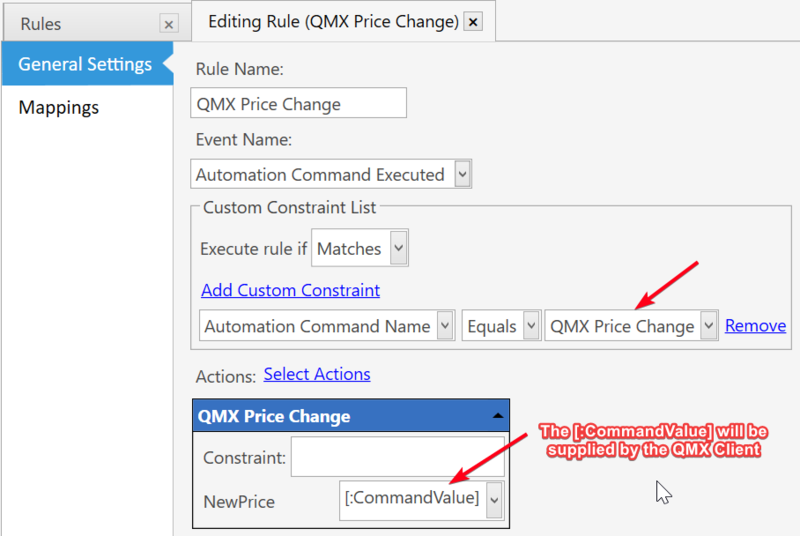 Only Automation Commands with the "QMX" prefix will be handled differently. 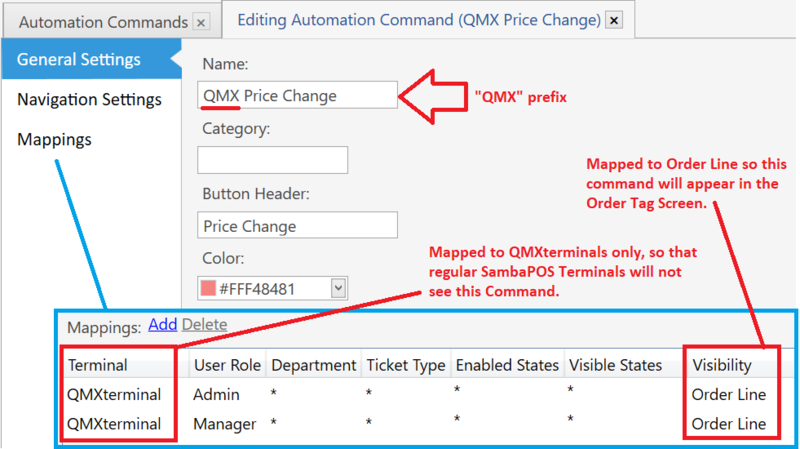 It is also good practice to map this Command specifically to QMX Client Terminals, so that it will be invisible to "regular" SamabPOS Terminals. Note the Command is mapped to the Order Line, so it will appear in the Order Screen (the Order Tag Screen). NOTE: the "QMX" prefix is not required. 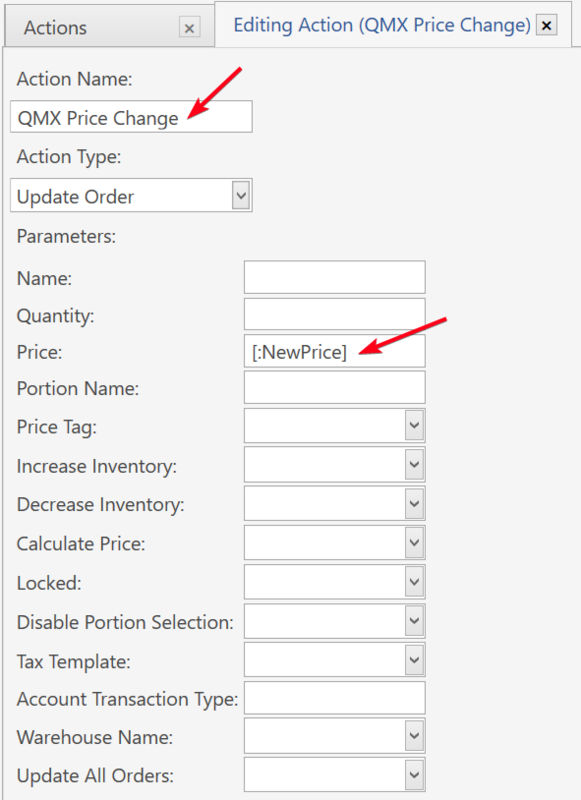 NOTE: again, the "QMX" prefix is not required. Note the Values list on this Automation Command has been populated. 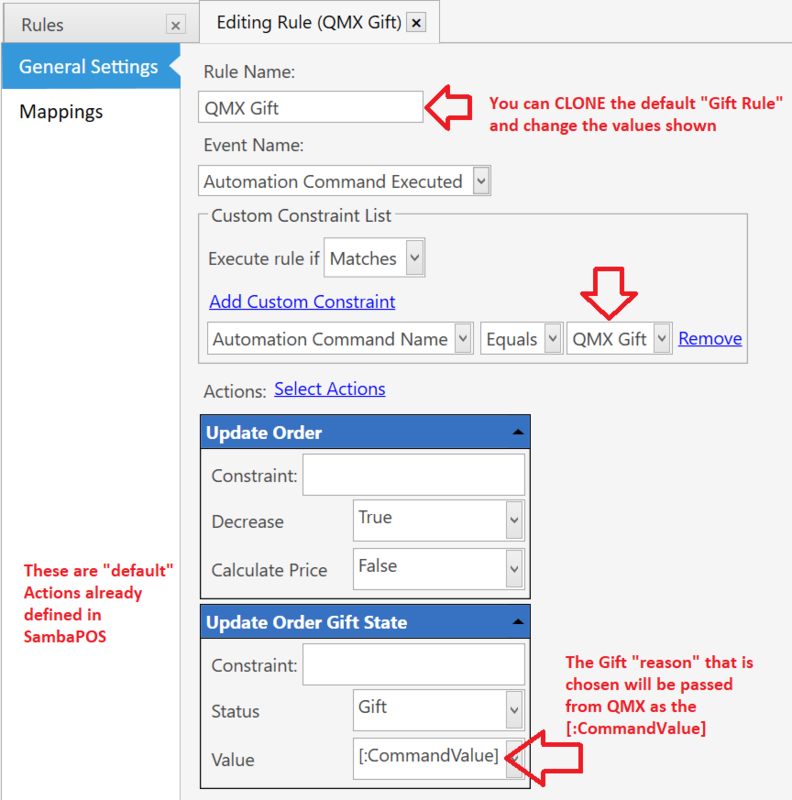 These Values will become the "choice buttons" in QMX when you click the Gift Order Command. We will use 2 generic default Actions that are used in various Automation Flows in SambaPOS, so there is no need to create anything special in this case.